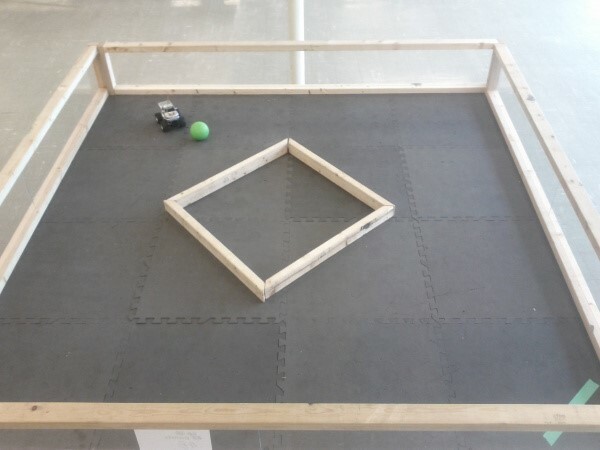 The object of this game is to use the remote control car to ‘push’ the green ball from one side of the field to the next. This game is scored by a stop watch. The team with the shortest time wins the challenge. The ball must cross the green taped area in order for the timer to be stopped. The table size is 8 feet by 8 feet. The course/maze can be done in various ways. This game can be a ‘Timed’ challenge to see who can go the fastest around the block (Table). Alternatively, you can have two robots on opposing sides and race around the table to see who go the ‘fastest’.